I imagine a voice that sounds like Sir Anthony Hopkins as the character Frank Doel in the movie 84 Charing Cross Road, one of my favorite movies. 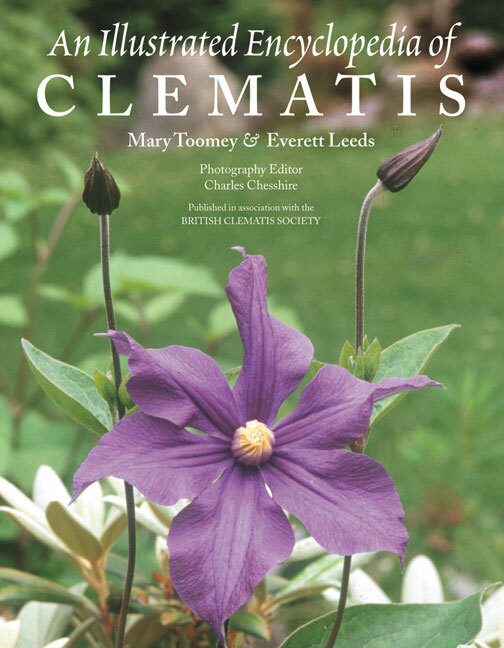 "Carol, I've found a very good used copy of An Illustrated Encyclopedia of Clematis by Mary Toomey and Everett Leeds (Timber Press, 2001) which I see is on the list of books you want. It is in excellent condition and the price is as low as I've seen it. Would you like me to send it to you?" I respond in a voice that is not at all like Anne Bancroft as the character Helene Hanff, in the same move. "Frankie, what are you waiting for? Don't tease me like that. Yes, of course, I want An Illustrated Encyclopedia of Clematis and trust your judgment that it is a copy worth the price. Can you send it right away? It's almost winter so I have time to read this book now. Oh, I know this book will lead me on countless hunts across the Internet for Clematis of all types, some of which I may covet but never find, but I am willing to risk that for those Clematis that I will discover through this book and eventually find for my own garden. But don't rest just yet, Frankie, I have some other books for you to look for. I'll send a list in a few days so you can get started on finding them in time for the holidays." Click. Add to cart. Click. Check out. Click. Click. Click. Confirm Order. Click. My new-to-me copy of An Illustrated Encyclopedia of Clematis arrived today. I've wanted this book for years. Many thanks to the secondary seller, The Salvation Army of Fort Wayne, Indiana, for putting this one up for sale on Amazon at "a very good price". I am one happy reading gardener this evening. Carol,it's always great to find a book that you have wanted for a long time. Congratulations for finding it, and at a good price. Enjoy! Score! Now I want that book as well. Stop it, Carol. I have to buy for others at this time of year. Good find and now I shall be checking with you when I need clemmie info! It's a fine book! There are many more clematis than what are contained in this volume. The problem I had was that I have an addiction problem and needed all of them. The next problem is that now I have over 200... SO BEWARE!